I, Spot, take you, Princess to be my furry wife. This past Saturday, more than 178 dog couples entered into “Howly Muttrimony” at the Bow Wow Vows in Littleton, CO. This will break the existing world record of the largest mass dog wedding — the current one is in Netherlands with 27 doggie weddings. Good luck to all of you beautiful couples! This entry was posted on Thursday, May 24th, 2007 at 10:30 am	and is filed under Dogs, National Dog, Cat & Pet Info, Events for Pets & Owners. You can follow any responses to this entry through the RSS 2.0 feed. Both comments and pings are currently closed. 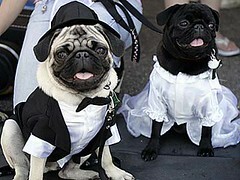 I posted your link in a post on my blog about dog weddings.